The famous site of the battle between David and Goliath. 1 Samuel 17 2: "And Saul and the men of Israel were gathered together, and pitched by the valley of Elah, and set the battle in array against the Philistines. " 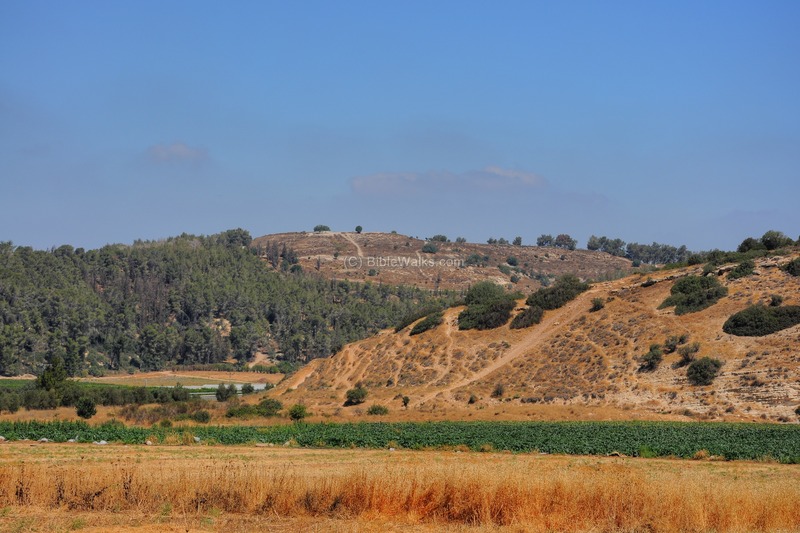 The valley of Elah is a triangle shaped flat valley, located on the western edge of the Judah low hills. Its Hebrew name, Elah, is named after the Terebinth (Pistacia Palaestina) tree. 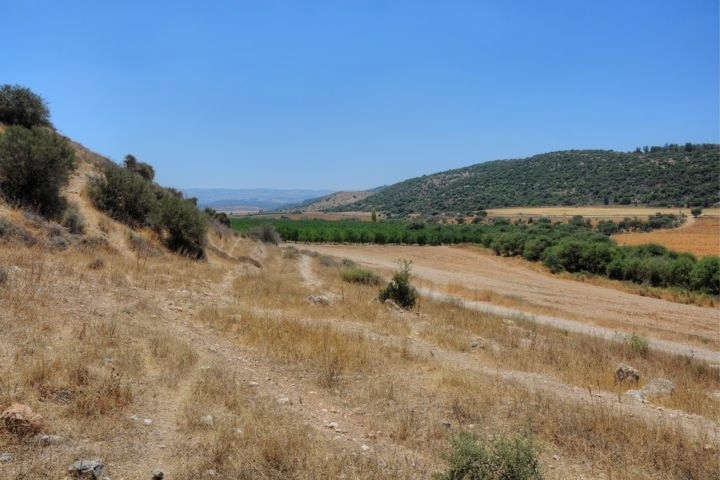 This valley was an important corridor from the coast cities, up to the center of the land Judah and its cities - Bethlehem, Hebron and Jerusalem. The valley of Elah was also the place of the famous Biblical battle between young David and the Giant Goliath, one of the classic Biblical drama stories. The Bible named several sites around the valley where the camps of the Israelites and the Philistines were located to watch the battle - Azekah (Azeka), Sha'arayim (Shaaraim) and Sochoh (Socoh). 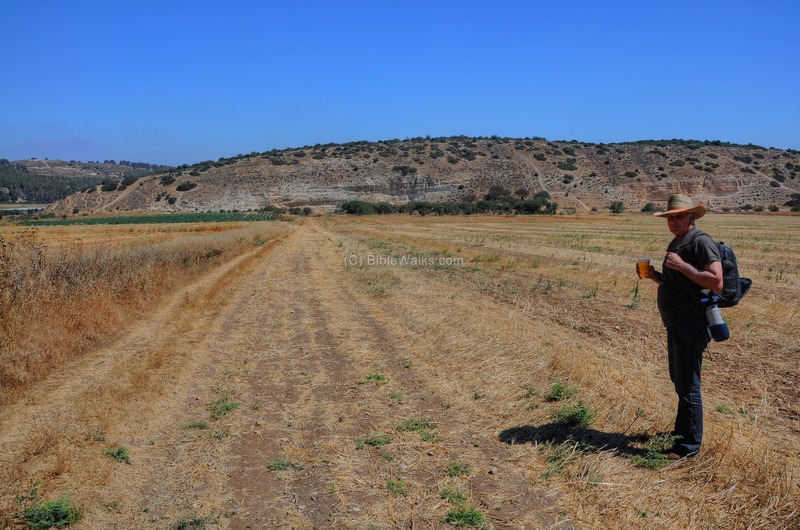 These Biblical sites were identified and some of them were excavated. These places are briefly described in this web page, but are detailed in other BibleWalks web pages. 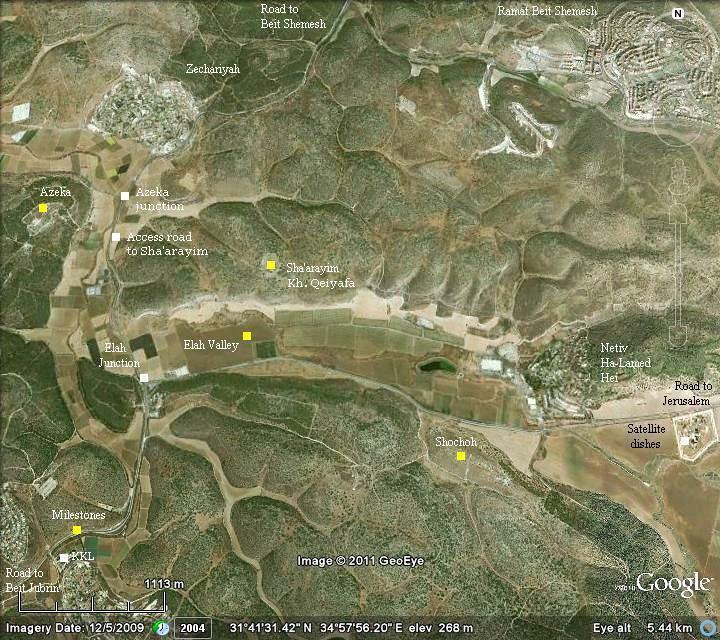 The following aerial map shows the points of interest, with the valley of Elah in the center. The major ancient sites marked on the map include Azeka, Sha'arayim and Sochoh - all related to the battle of David vs Goliath. According to the Bible, the Philistines were located on the south side of the valley, while the Israelites watched the battle on the north side. 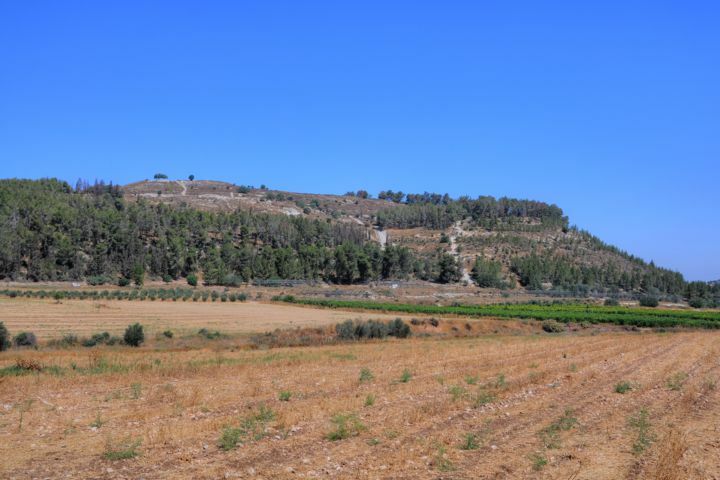 In the valley of Elah was the great battle between young David and the Giant Goliath, who settled the war between the Israelites and the Philistines by a single combat between the two champions of each side. The battle happened at about 1010BC ,after the Philistines attempted to push along the valley of Elah towards the heart of the kingdom of Judah. 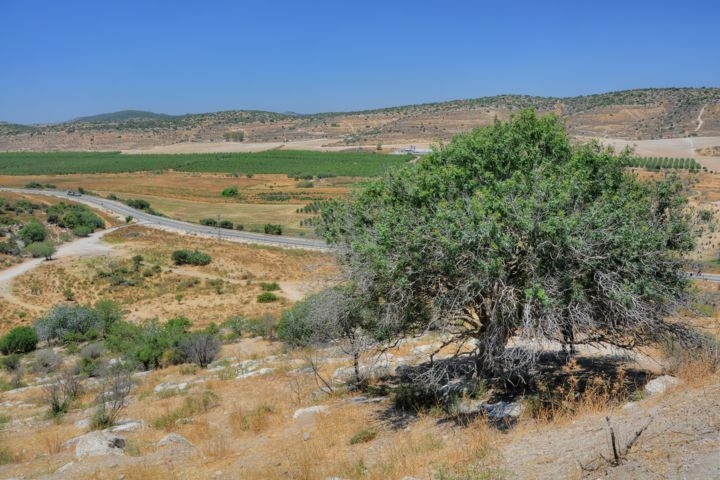 King Saul and his Israelite army blocked them, facing the Philistines at Sochoh in the center of the valley. The Philistine giant, Goliath of the nearby city Gath, challenged the Israelites to fight him in order to determine the fate of the battle, but no Israelite soldier dared to take this challenge. Only the young David, an untrained shepherd who came to assist his elder brothers, bravely volunteered for this fight. The two camps watched the fight on both sides of the valley (see map on the right). To summarize the battle: David, with just 5 stones and a sling, faced the giant Goliath which was heavily armed. The young shepherd, drawing his strength from his faith in God, shot the rock into the center of the giant's forehead, knocking him down, then took his sword and cut of his head. Israel wins, chasing the Philistines out of the valley of Elah. The battlefield is described (1 Samuel 17 1-4, 50): "Now the Philistines gathered together their armies to battle, and were gathered together at Shochoh, which belongeth to Judah, and pitched between Shochoh and Azekah, in Ephesdammim. And Saul and the men of Israel were gathered together, and pitched by the valley of Elah, and set the battle in array against the Philistines. And the Philistines stood on a mountain on the one side, and Israel stood on a mountain on the other side: and there was a valley between them. And there went out a champion out of the camp of the Philistines, named Goliath, of Gath, whose height was six cubits and a span." Goliath, the Philistine giant from the city Gath (located about 10km downstream), is heavily armed (1 Samuel 17 5-7): "And he had an helmet of brass upon his head, and he was armed with a coat of mail; and the weight of the coat was five thousand shekels of brass. And he had greaves of brass upon his legs, and a target of brass between his shoulders. And the staff of his spear was like a weaver's beam; and his spear's head weighed six hundred shekels of iron: and one bearing a shield went before him". 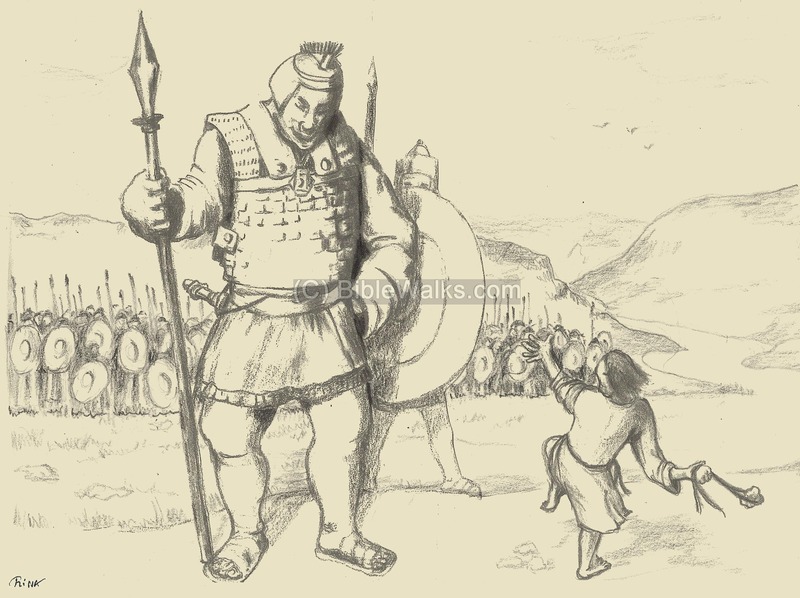 Goliath challenges King Saul's soldiers (1 Samuel 17:8-10): "And he stood and cried unto the armies of Israel, and said unto them, Why are ye come out to set your battle in array? am not I a Philistine, and ye servants to Saul? choose you a man for you, and let him come down to me. If he be able to fight with me, and to kill me, then will we be your servants: but if I prevail against him, and kill him, then shall ye be our servants, and serve us. And the Philistine said, I defy the armies of Israel this day; give me a man, that we may fight together". No Israelite soldier was brave enough (1 Samuel 17:11): "When Saul and all Israel heard those words of the Philistine, they were dismayed, and greatly afraid". Only David took the challenge (1 Samuel 17:32): "And David said to Saul, Let no man's heart fail because of him; thy servant will go and fight with this Philistine." David refused to be armed, taking only 5 stones and a sling (1 Samuel 17:38-40): "And Saul armed David with his armor, and he put an helmet of brass upon his head; also he armed him with a coat of mail. And David girded his sword upon his armor, and he assayed to go; for he had not proved it. And David said unto Saul, I cannot go with these; for I have not proved them. And David put them off him. And he took his staff in his hand, and chose him five smooth stones out of the brook, and put them in a shepherd's bag which he had, even in a scrip; and his sling was in his hand: and he drew near to the Philistine." David approached Goliath, who mocked him (1 Samuel 17:41-44): "And the Philistine came on and drew near unto David; and the man that bare the shield went before him. And when the Philistine looked about, and saw David, he disdained him: for he was but a youth, and ruddy, and of a fair countenance. And the Philistine said unto David, Am I a dog, that thou comest to me with staves? And the Philistine cursed David by his gods. And the Philistine said to David, Come to me, and I will give thy flesh unto the fowls of the air, and to the beasts of the field". David replied (1 Samuel 17:45-47): "Then said David to the Philistine, Thou comest to me with a sword, and with a spear, and with a shield: but I come to thee in the name of the LORD of hosts, the God of the armies of Israel, whom thou hast defied. This day will the LORD deliver thee into mine hand; and I will smite thee, and take thine head from thee; and I will give the carcasses of the host of the Philistines this day unto the fowls of the air, and to the wild beasts of the earth; that all the earth may know that there is a God in Israel. And all this assembly shall know that the LORD saveth not with sword and spear: for the battle is the LORD's, and he will give you into our hands". Finally, the fight (1 Samuel 17:48-51): "And it came to pass, when the Philistine arose, and came, and drew nigh to meet David, that David hastened, and ran toward the army to meet the Philistine. 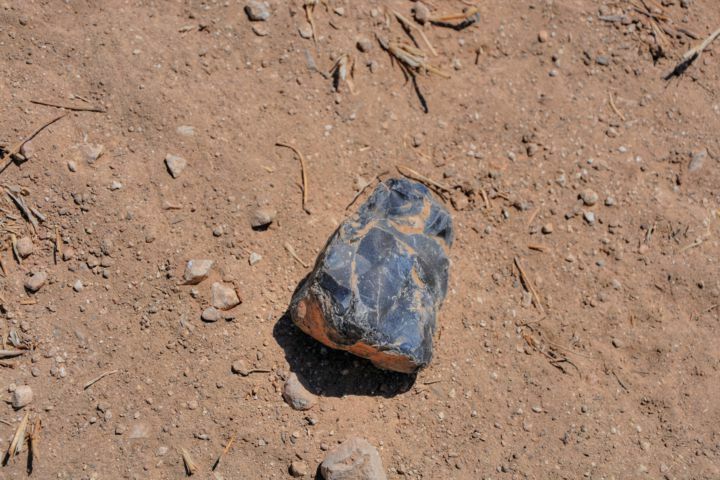 And David put his hand in his bag, and took thence a stone, and slang it, and smote the Philistine in his forehead, that the stone sunk into his forehead; and he fell upon his face to the earth. So David prevailed over the Philistine with a sling and with a stone, and smote the Philistine, and slew him; but there was no sword in the hand of David. Therefore David ran, and stood upon the Philistine, and took his sword, and drew it out of the sheath thereof, and slew him, and cut off his head therewith. And when the Philistines saw their champion was dead, they fled". The Philistines fled from the battle, back to their cities, and David came the great hero, honored by the nation and King Saul (1 Samuel 17:52-54): "And the men of Israel and of Judah arose, and shouted, and pursued the Philistines, until thou come to the valley, and to the gates of Ekron. And the wounded of the Philistines fell down by the way to Shaaraim, even unto Gath, and unto Ekron. And the children of Israel returned from chasing after the Philistines, and they spoiled their tents. And David took the head of the Philistine, and brought it to Jerusalem; but he put his armor in his tent". 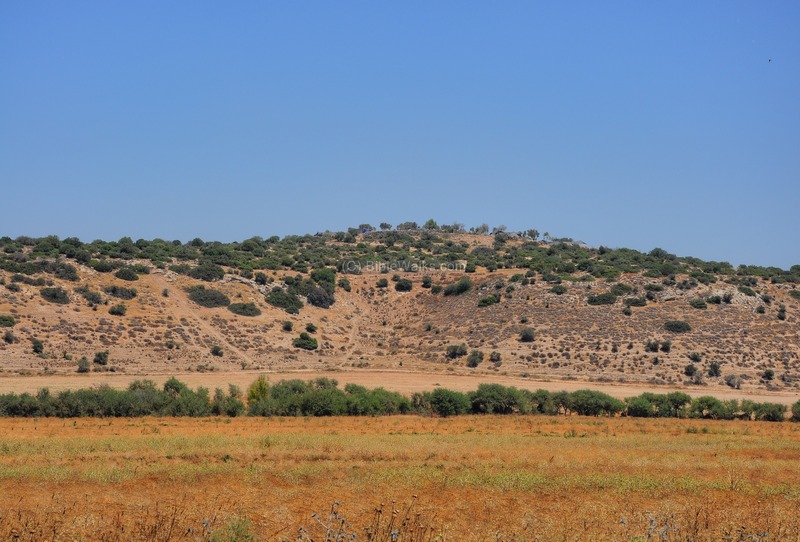 The land around the valley of Elah was part of the tribe of Judah. 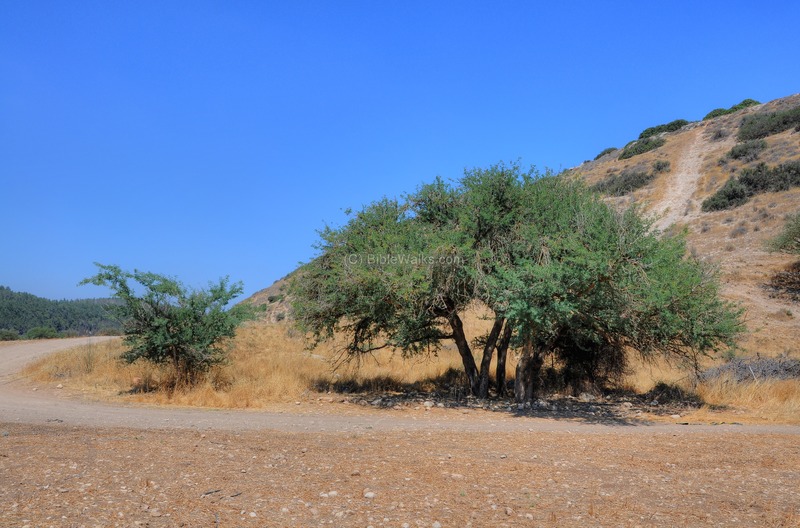 It is named after the Terebinth (Pistacia) trees that grow in the Holy Land. A Biblical map is seen below, indicating the cities and roads of those periods (Canaanite through Roman). The location of valley of Elah is indicated as a red square in the Biblical map below. The is the location of the battle of David and Goliath, near or west to the location of the city of Socoh (or: Sochoh, Shochoh). Notice the dashed line of the ancient road that ascends from the valley of Elah to Jerusalem, passing at the site. This road connected the coast cities to Jerusalem and Bethlehem. 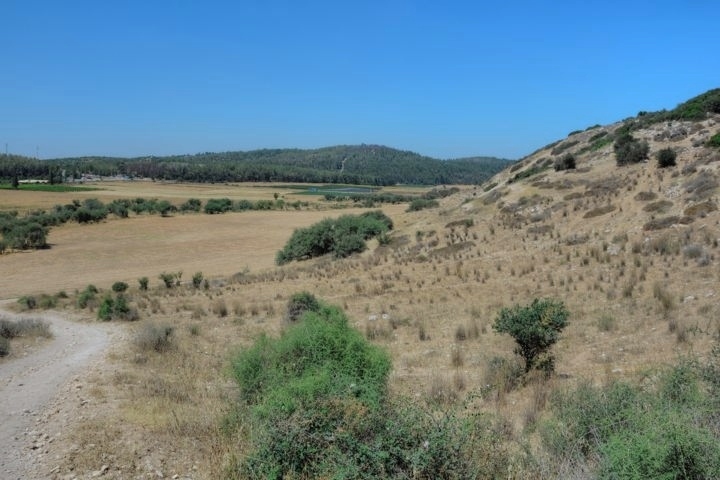 The valley of Elah was used by the Philistines to attack Judah even after the failed battle of Goliath. After David became King, they attacked through the same route to capture Bethlehem (implied in 1 Chronicles 14 8-17). Years later, during the times of King Ahaz (734BC), they captured Socoh and the villages around it (2 Chronicles 28:18-19): "The Philistines also had invaded the cities of the low country, and of the south of Judah, and had taken Bethshemesh, and Ajalon, and Gederoth, and Shocho with the villages thereof, and Timnah with the villages thereof, Gimzo also and the villages thereof: and they dwelt there. For the LORD brought Judah low because of Ahaz king of Israel; for he made Judah naked, and transgressed sore against the LORD". The Babylonians campaign to defeat Judah (597-582BC) passed the valley of Elah through Azekah (Jeremiah 34 1,7): "...when Nebuchadnezzar king of Babylon... fought against Jerusalem, and against all the cities of Judah that were left, against Lachish, and against Azekah: for these defenced cities remained of the cities of Judah". One of the major Roman roads from Jerusalem to the coast passed through the Elah valley, following the path of Biblical way. 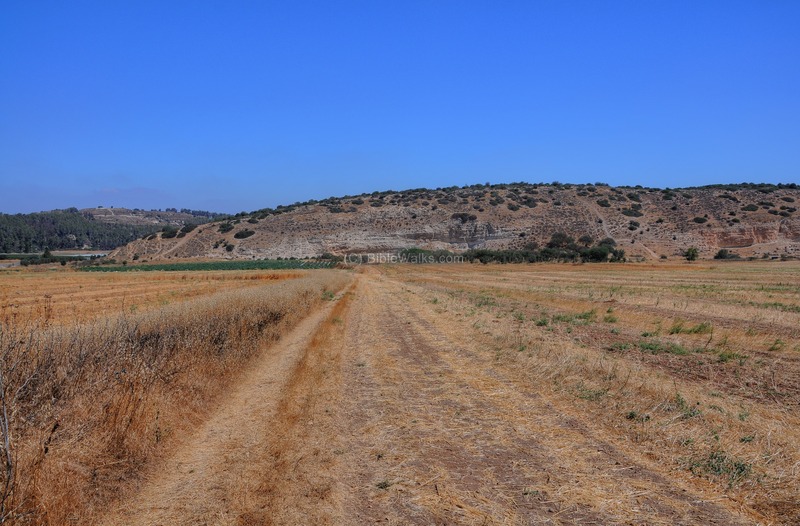 The Roman road on this section is part of the ancient road from Ashkelon, a large Roman port city on the coast, to Bethlehem and Jerusalem. 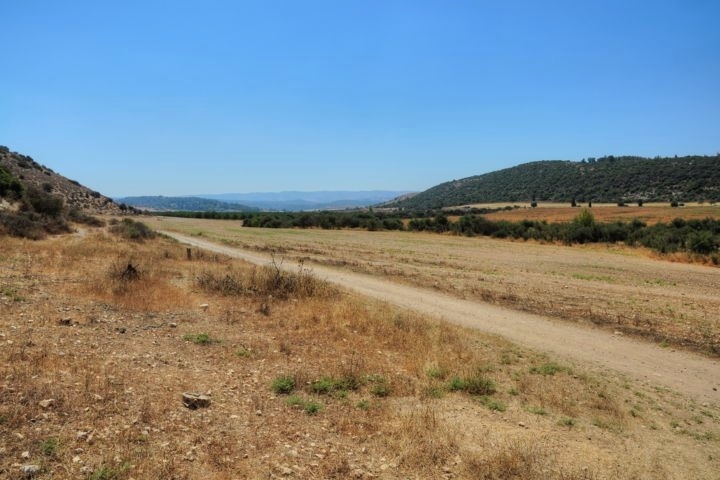 The Roman road was repaired and enlarged during the campaign of the Roman Caesar Hadrian, who crushed the second Jewish revolt against the Romans - known as the Bar Kochba revolt (132-136AD). This date of the construction is not certain, and relies on the inscription on a milestone found along the road. Bar-Kochba and his troops made their last stand against the might of the Roman forces in Betar, a fortified village which is located along the road. The Peutinger Map (Tabula Peutingeriana) is a medieval map which was based on a 4th C Roman military road map. The map shows the major roads, with indication of the cities, and geographic highlights (lakes, rivers, mountains, seas). Along the links are stations and distance in Roman miles (about 1.5KM per mile). The roads are shown as brown lines between the cities and stations. In the section shown below is the area of Jerusalem, drawn in a rotated direction (Egypt on the left, the Mediterranean sea on the top). Jerusalem is illustrated in the center as a double house icon, which represents a major city. It is listed as "formerly called Jerusalem, now called Aelia Capitolina" (antea dicta Hierusalem n(unc) Helya Capitolina). 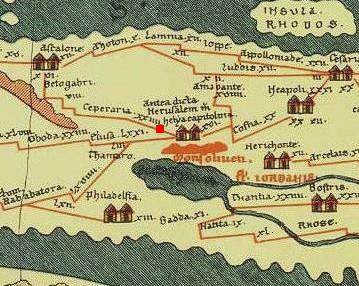 Part of Peutinger map, based on 4th C Roman road map. The area around the valley was examined in the Palestine Exploration Foundation (PEF) survey (1866-1877) by Wilson, Conder and Kitchener. This area appears in the center of the section of the map of 1878 (below). The valley of Elah appears on this map in its Arabic form - "Wadi es Sunt" (the valley of the Acacia). The Roman road passing thru the place is marked as double dashed lines, and meets another road on the left side with a title of "Roman Road". 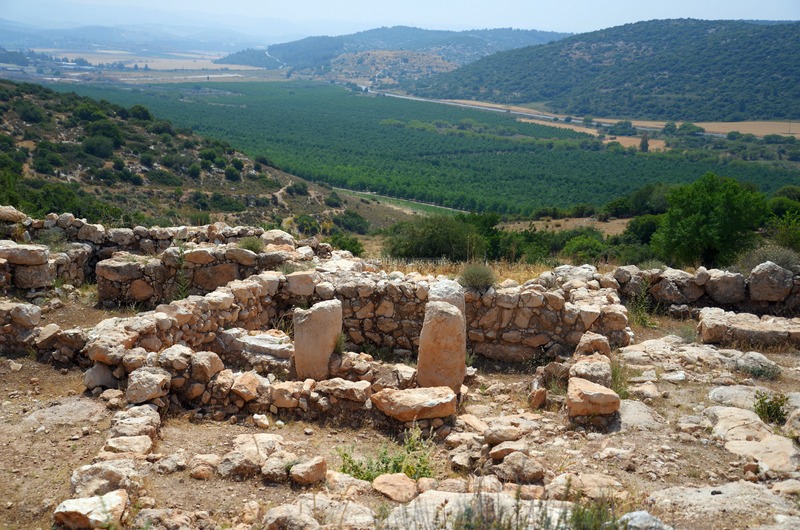 Khurbet Kiafa - the ruins of Biblical Sha'arayim. Their report was merely: "Heaps of stones". foundations, and pillar shafts and bases." Kh. Shuweikeh - the eastern side of Biblical Socho. Their report was: "Foundations and ruined walls, caves, cisterns, heaps of stones, and two rock-cut wine-presses". They also identified it as Socoh, and wrote that this identification dates to the 4th C.
Khurbet Aklidia - Roman/Byzantine ruins. Their report was: "Foundations, heaps of stones, and cisterns.". Wady es Sunt - they identified it as the valley of Elah. On the east side of the valley is a satellite relay center, which is primarily used to broadcast Television through a cluster of dishes. 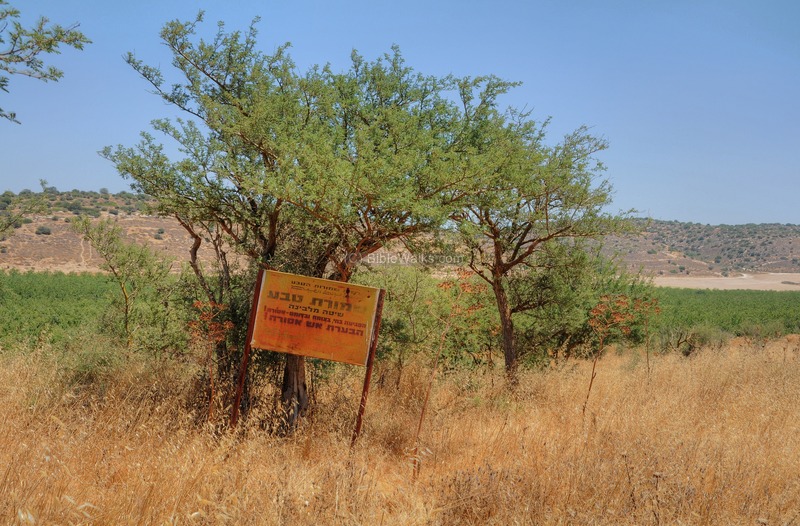 A Kibbutz is located in the center of the valley, named Halamed-Hei ("path of the 35"), named after the convoy to Gush-Etzion who were killed during the Independence war. The Kibbutz was established in 1949. 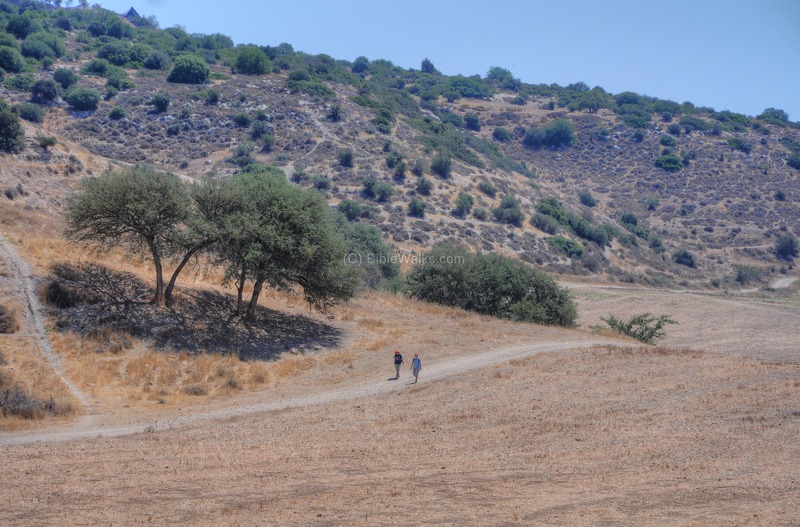 Along the valley are agriculture fields, and you can hike through paths that cross the valley and the Elah stream which is dry most of the year. A nature reserve is located along the road between the Kibbutz and the western edge of the valley, with rare Acacia trees. A drone view of the eastern side of the valley is seen here. The valley stretches until the low hills that ascend up to the Hebron and Bethlehem mountain area. An ancient road once ascended through the valley to Jerusalem. From the same point of the valley, but towards the west side, is the following photo. Azekah, ruins of a Biblical city, is located on the hill on the right far background. A great place to start exploring the valley is from the Elah junction, where you can park the car near a roadside restaurant. From the junction is a short walk through the field towards the western edge of the northern bank, which is seen here in the background. According to the Biblical account, this is probably the site of the battle of David and Goliath. According to the description, we can assume that the Israelite camp was located on the north hill which is seen at the edge of the valley. The next picture shows a closer view of the north-west side of the valley. The Elah stream loops around the edge of the hill on its way north-west. The city of Azekah, which is listed among the cities where the camp of the Philistines was located, is seen here on top of a hill in the center of the far background. We found a small flint stone on the floor of the stream at this location. The stone is seen in the picture below. With some imagination: this stone may have been one of the 5 smooth stones David picked up here in the stream while preparing to the battle with the giant, and one of them hit his forehead... (1 Samuel 17 40): "And he took his staff in his hand, and chose him five smooth stones out of the brook, and put them in a shepherd's bag which he had, even in a scrip; and his sling was in his hand: and he drew near to the Philistine". Along the north side of the valley are high cliffs, about 30m above the floor of the valley. This may have been an old quarry site. These north hills were probably the place where the Israelites watched the battle, facing the Philistines who encamped on the south side of the valley. A pair of hikers are seen walking along the path. The valley, at an average height of 300m above sea level, is wide. The next photo, with a south-west view towards the Elah junction on the top-left side, shows the road that leads up to Kh. Kaifa (identified as Biblical Sha'arayim). A view of the eastern side of the valley is seen below. On the south side of the valley, in the center of the far background, is a brown hill. 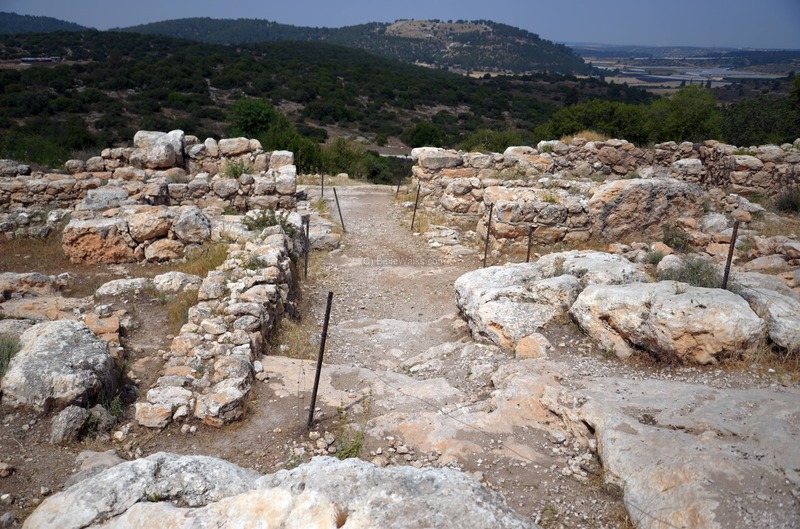 This is the city of Sochoh, where the eastern side of the Philistines camp was located. Remains of a Biblical city, dated to the times of David, are seen above the north bank. 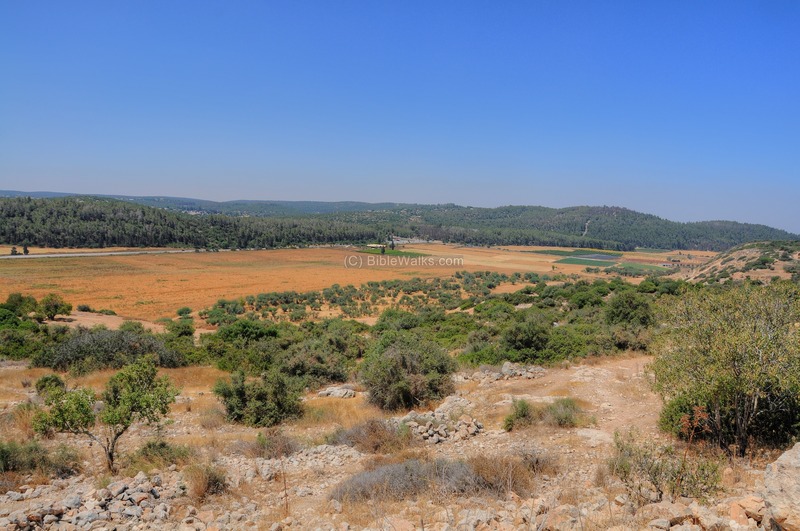 This was the city of Sha'arayim ("two gates"), which was named in the Biblical account of the David & Goliath battle (1 Samuel 17: 52): "And the men of Israel and of Judah arose, and shouted, and pursued the Philistines, until thou come to the valley, and to the gates of Ekron. And the wounded of the Philistines fell down by the way to Shaaraim, even unto Gath, and unto Ekron". The site, named Kh. Kiafa (Qeiyafa), is undergoing extensive excavations since 2007/2008. The archaeologists unearthed a pair of gates, which fit to the name of the city and made its identification almost certain. The western gate is seen below, with Azekah in the center of the far background. A south-east view of the valley is seen below. The brown hill in the center, beyond the valley, is the location of Socoh (Shochoh). More info on this site is provided on a separate page on Sha'arayim. The ruins of the ancient city of Sochoh (Sokho, Shochoh), lies on the south side of the center of the valley, located on a steep hill. The Arabic names of the ruins are also known as Kh. Abbad (west side) and Kh. Shuweikah (east side). The picture below shows a north-west view from Sochoh towards the Elah Valley, with an Elah tree (Terebinth - Pistacia) growing on its foothill. On top of the hill are many traces of walls, installations and cisterns. 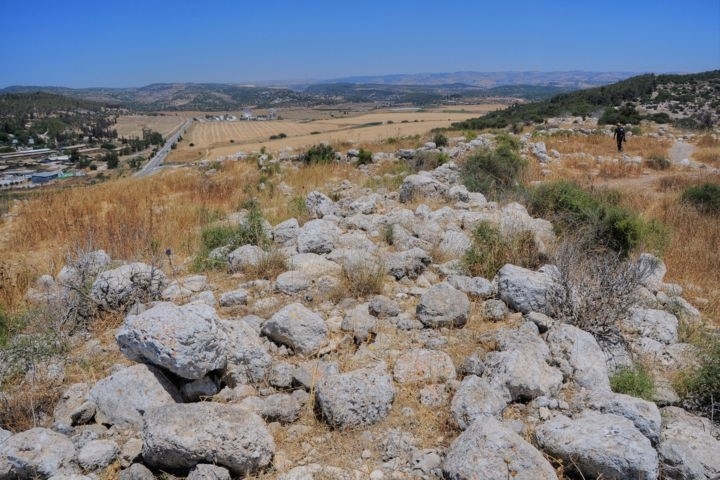 The next picture shows a view from the top of the ancient site, looking eastwards to the eastern edge of the valley of Elah. The Kibbutz Netiv Halamed-Hei is on the left side, while the satellite dishes are seen in the far center. More info on this site in a separate page on Sochoh. 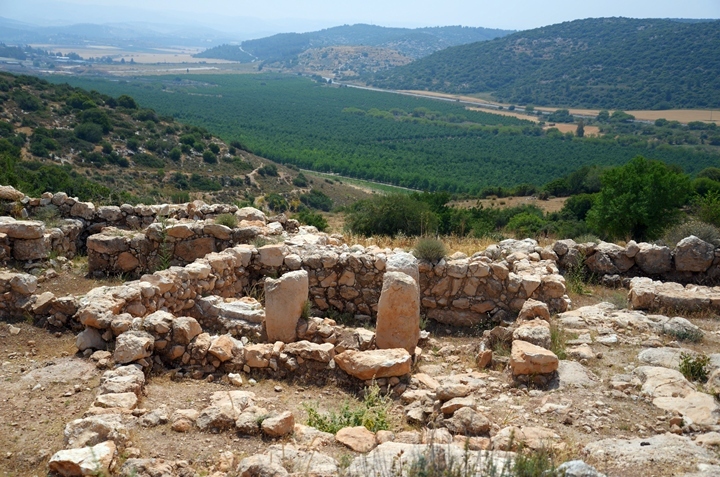 The ruins of the city of Azekah is located on a high hill, north-west of the Elah valley. The Philistines encamped here during the battle. 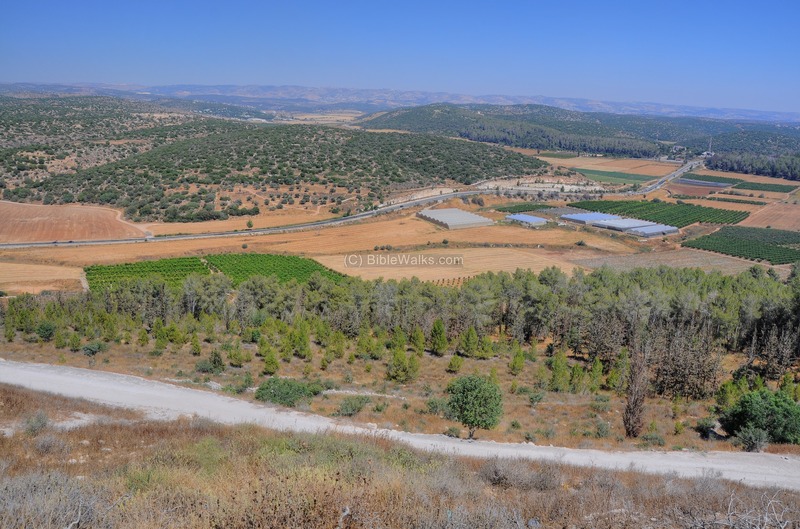 From the top of the hill are great views of the area, including a view of the western section of Elah valley, as seen in the next picture on the far right. 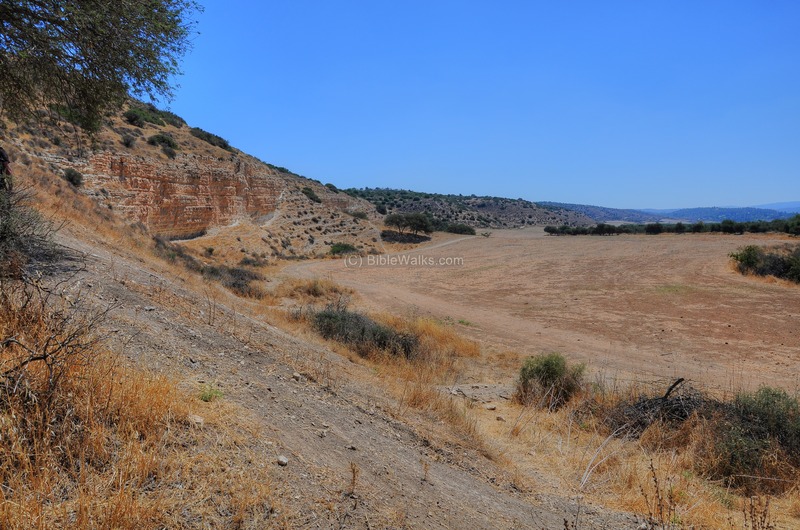 The stream of Elah actually bends around the hill and flows north (left), following the path of the road. More info on this site in a separate page on Azekah. 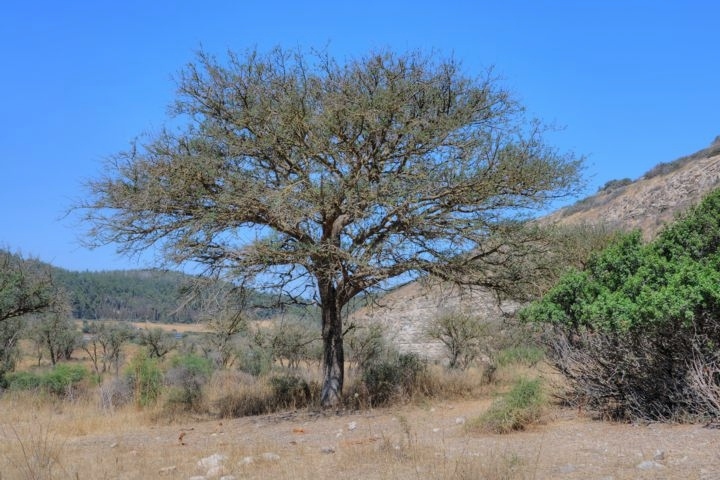 A nature reserve of the rare "Shittah Malbina" tree (white Acacia; Acacia albida; Faidherbia albida; Ana tree) is located on the western side of the valley. 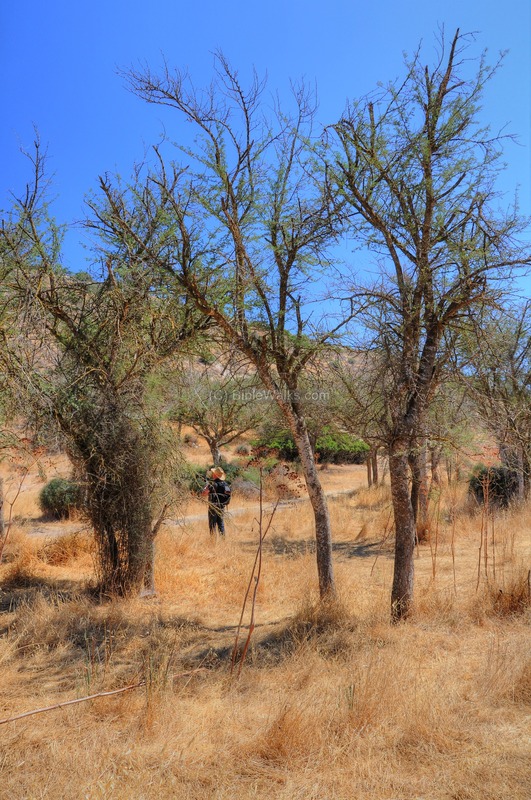 These trees are unique and rare in Israel, and look like African prairie lands. 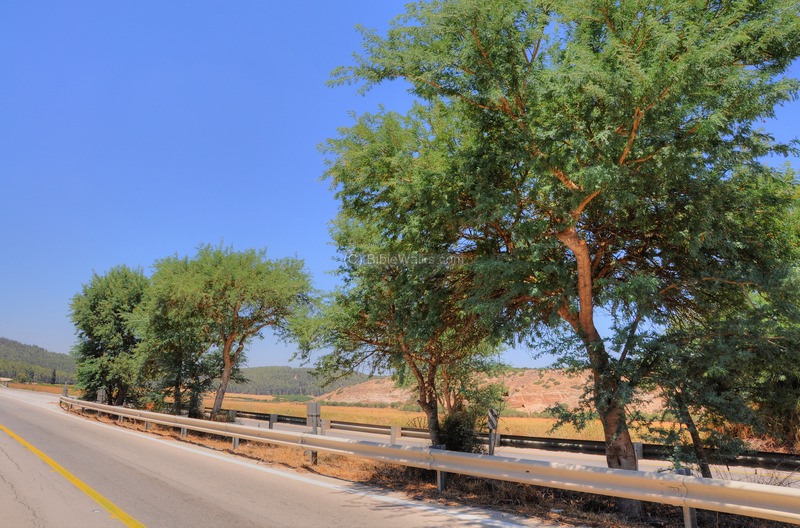 There are a few areas with such trees, such as in Tell Shimron and Nahal Tabor. A group of such trees can be seen in the center of the road, east of the Elah junction. The road was planned as a divided highway in order to save the trees. These trees also grow along the stream, which is located close to the northern side of the wide valley. The Elah stream is mostly dry during the year, and flows only during rainy winters. 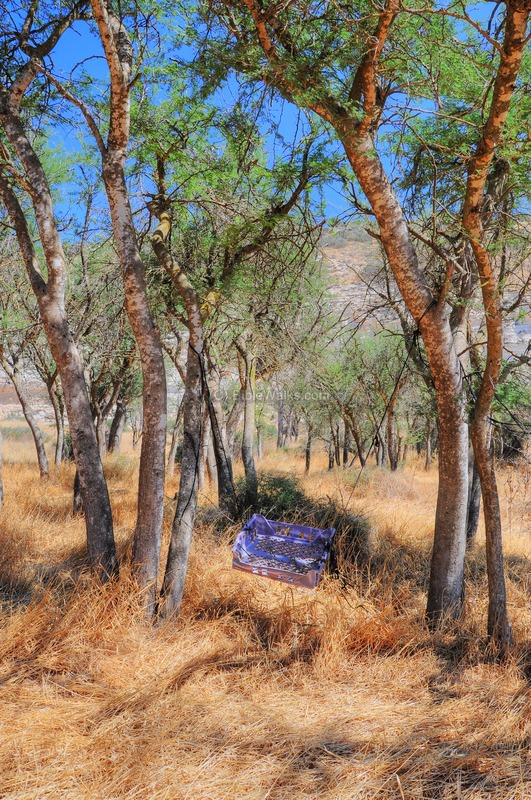 The Bible refers to the Shittah as a desert tree (Isaiah 41 19): " I will plant in the wilderness the cedar, the shittah tree, and the myrtle, and the oil tree; I will set in the desert the fir tree, and the pine, and the box tree together:"
Some parts of the nature reserve seem like a forest. A makeshift seesaw hangs on two branches. Yechiel, seen below between the trees, tries to photograph birds nesting on the trees. Another view of the north side of the valley, with a couple of Acacia trees, is seen in the next picture. * Elah - the Hebrew name of the Terebinth (Pistacia palaestina) tree. In the KJV Bible, the Hebrew "Elah" was translated as "oak" (2 Samuel 18 9): "And Absalom rode upon a mule, and the mule went under the thick boughs of a great oak, and his head caught hold of the oak..."
* Sochoh - the Biblical name of the city. The Arabic names (Kh. Abbad, Shuweike) preserved the ancient name.